I process my wood in the lot behind my office but I'm looking for a used electric splitter for occasional use at home. I search local CL and Pennswoods often and this is the first time I've ever seen a Super Split advertised. (08-02-2019, 18:46 )steerforthresistant Ha scritto: [ -> ] I process my wood in the lot behind my office but I'm looking for a used electric splitter for occasional use at home. I search local CL and Pennswoods often and this is the first time I've ever seen a Super Split advertised. Guys, jump on them when they come up for sale( if you are looking) Most of the parts are easily replaced and paul has everything shipped to you in no time at all. He charges very reasonable prices for all parts and is a pleasure to deal with. Mine is about 25 years old and runs like a champ. I would estimate a few thousand cords through it. And an electric motor can be swapped out easy peasy. I bought a rugged made. Rated 37 ton with what I believe is a six inch ram. 4 way wedge and a log lift with a 15 horse motor. It came to a little more than $ 3,300.00 shipped with all the oil and the battery for the electric start. You have to put yourself together for the buck. I've split about 4 cord with it and I am impressed. My arborist buddy split 5 cord with it and ordered his own. I guess he liked it ... And he is picky about his equipment. I looked at the Rugged Made splitters, but couldn't find enough info for me to have better than a guess as to it's value or application. If you have a chance, post a video of it in action. I'd be curious to see that. (08-02-2019, 18:48 )steerforthresistant Ha scritto: [ -> ] I looked at the Rugged Made splitters, but couldn't find enough info for me to have better than a guess as to it's value or application. If you have a chance, post a video of it in action. I'd be curious to see that. With just one swing of the ax, I can split a big, fat log into four equally sized pieces of fire wood .....with just one swing .....like, no kidding here.....Capiche! ....... like, why bother with a gas powered, hydraulic wood splitter ........ when all you really need is a good, sharp ax......isn't an ax what was used to split wood for hundreds of years ...... or maybe a splitting wedge with a sledge hammer ...... but probably just a sharp ax? I split all my firewood with a maul. The straight grained wood seen in the videos splits very easily. Anything cut on an angle or with branch bases in it was more difficult. Some of the pieces were wasted because it was too hard to split. I suspect a log splitter would take care of those. We are given a great deal of tools that have greatly increased the convenience with that we tend to do a great deal of tasks that might have been terribly tough to accomplish. one in every of such tools may be a log splitter. 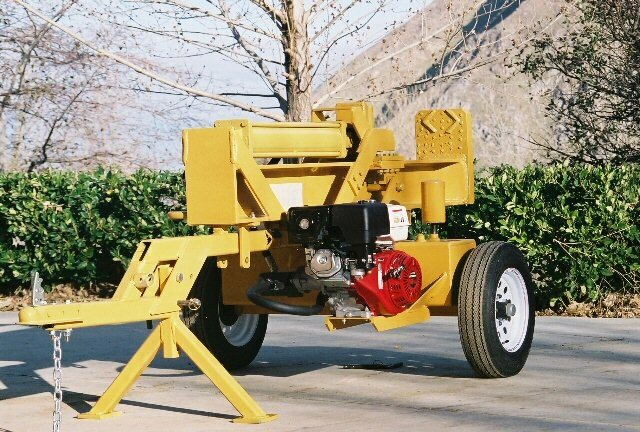 Ordinarily, a log splitter may be a tool that's accustomed impede and split logs into smaller items. With this tool, the rending of woods would become a great deal easier and you'll even save many hours that might are lost to victimisation ancient tools just like the axe and different less effective choices. Recently, there area unit a great deal of choices that anyone World Health Organization wants an advertisement log splitter will select from. there's the manual splitter, gas splitter, an electrical splitter, and every one of them area unit increased to hold out the duty effectively while not problem. For a firm or individual World Health Organization is searching for an advertisement log splitter, it's necessary to notice that, a log splitter that might work effectively reception for a smaller volume of logs might not be as effective once used commercially. Hence, the proper business log splitter ought to be a high-end product that's able to defy heavy-duty log rending job with none issue.